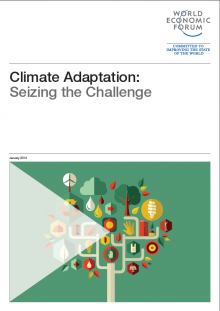 A report on adaptation was released at the recent World Economic Forum in Davos. The 40 page report is titled, Climate Adaptation: Seizing the Challenge. The report offers the most up-to-date thinking in the field of climate adaptation and financing. The primary goal of this report is to assist decision-makers in the public and private sectors so that they can gain a better understanding of climate adaptation. The report is premised on the understanding that reductions in greenhouse gases (GHGs) are not occurring at a quick enough rate to stave off the worst impacts of climate change. This implies that alongside ongoing efforts to mitigate climate impacts, societies also need to develop adaptation strategies. The report indicates that decision makers need to look at “total climate risk” when considering adaptation investment and finance. This implies taking into account existing risk, future risk due to development and additional risk due to climate change. The report suggests that with cost effective adaptation strategies up to 65 percent of projected losses can be averted. It further suggests that due to the financial constraints impinging upon government budgets, much of the money will need to come from the private sector. The public sector must work to ensure that this is an attractive private sector opportunity. To access the report click here.